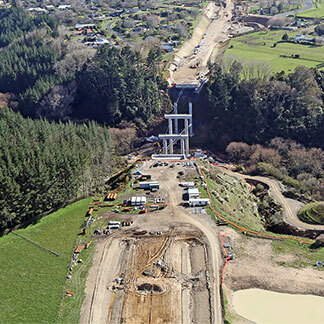 The Transport Agency Board has approved $458 million for the design and construction of the Huntly section of the Waikato Expressway(external link), with construction to start in 2015. The winter months have seen less activity at both Rangiriri and Cambridge sections, however, work continues on bridges, interchanges and some pavement work. On the Hamilton section, where investigation and design continues, a public information day was held earlier this month to present options being considered for possible connections to the Expressway at Resolution Drive. The most northern section, Longswamp, is also in investigation and design stage, with a preferred option now determined. Sign up(external link) for the Waikato Expressway e-newsletter. Pavement construction, with over 100 lane kilometres to be laid. Landscaping, with most of 300,000 natives to be planted by the end of winter. Finishing off structures such as the Mangatawa interchange, the Domain Road interchange and the Parton Road over bridge. The team are also busy preparing for the construction of the westbound lanes between the Domain Road interchange and the Te Maunga roundabout. The focus for the project is also moving towards the tolling aspect of the road. The TEL will be tolled from the Domain Road interchange to the Paengaroa roundabout. The interchange will be the decision-point for drivers heading east for whether they want to take the toll road or the free alternative route, through Te Puke. The foundations for the toll gantry have been put in place and the electronic toll gantry, similar to what is used on the Northern Gateway Toll Road, is planned to be installed around September - October. One of the benefits of using the toll road is that drivers can expect to save around 12 minutes in one direction by using the TEL, or 24 minutes on a return journey. Details of the payment methods and final toll prices will be available later this year. The Transport Agency is also seeking public input into what the official name for the toll road should be. The top five options selected by key stakeholders are now open for voting on via an online survey. The two options with the most public votes will be presented to the Transport Agency Board for the final decision. Have your say(external link) on a name for the new TEL toll road (closes 18 September).